Seminole Magazine is lhaving a Route 46 Blogger Contest. They are looking for local, Seminole County bloggers to contribute to ther magazine by blogging and "Building Community." http://seminolemagazine.com/2012/05/17/route-46-building-community-blogger-contest. You'll need to register, then login to vote, but I sure would appreciate your vote. I am Leon and I write Central Florida's Good Eats under the a name Lake Mary Food Critic. I love to write about local happenings, especially when they revolve around food, and I'm sure I'd be a great contributor to their magazine! Thank you! All I can say is, "what took me so long to eat here?" 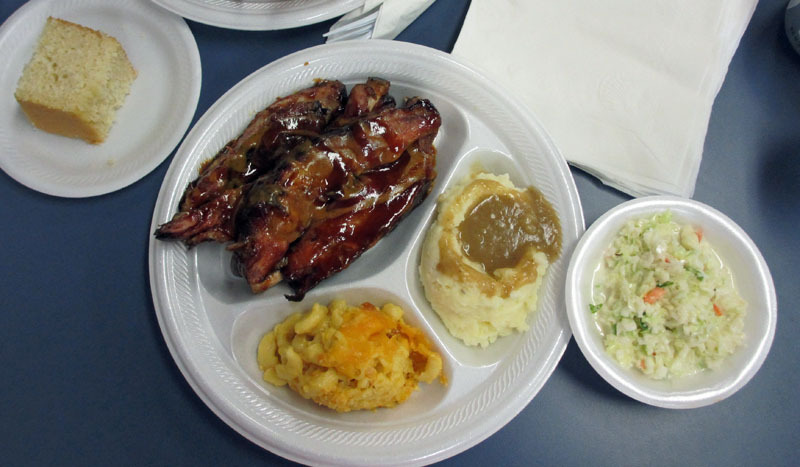 My friend Tommy and I had dinner at Angel's Soulfood and BBQ on a recent Saturday afternoon and found a real gem: gool ole' down home cooking. No pretention. No fancy tablecloths. Just good good food, and plenty of it, at a very reasonable price. I'm hooked--I'll be back again for more, no doubt! Angel's is a pretty simple, down home place--neat, clean, fresh, and organized. You walk in and order at the counter and they bring your food out to you. But not worry, they check on you from time to time as well. For my dinner, I had the BBQ ribs with mashed potatoes and gravy, cole slaw, and mac and cheese. The ribs? Well, they were wonderful! Meaty, tender, juicy, a nice bit of fat--and falling off the bone. With a nice, baked in BBQ flavor, they were all a nice meaty rib should be: finger lickin' good--and I did a lot of finger lickin! The mashed potatoes were outstanding--I'd swear my momma was in that kithen making them and the gravy, they were that good. The cole slaw was good as well, and the mac and cheese was all I expected with a nice cheesy goodnes. 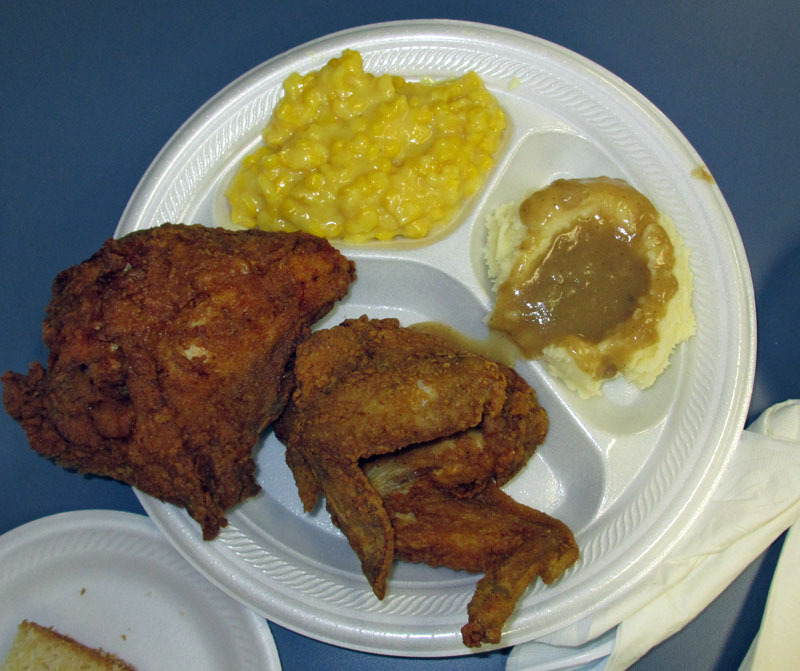 This meal was a hit--good, down home goodness on a plastic plate. Yumm! My friend Tommy had a fried chicken dinner. Let me tell you, this was fried chicken done right! The breaded coating was crisp and not too heavy, the chicken inside was steamy hot and tender and juicy. It was a full half chicken, a breast, a leg quarter, and a wing. And every piece was tender-juicy and flavorful. Tommy also had the mashed potatoes and gravy and the coleslaw. But he also had the creamed corn and it was very good with a nice corn flavor, not at all tinny like from a can. We both had cornbread with our meals and this was almost like a cake, very light and fluffy and sweet--but good with a mild corn flavor. We both enjoyed our meal here and would certainly go back. This is down-home cooking done right. No wonder they've been around for well over a dozen years on Sanford Avenue, just off of first street in historic downtown Sanford. I loved it--I'll be back! I was excited when I heard that the Yalaha Bakery had opened up a store in Orlando and I recently stopped in there. I was not disappointed. 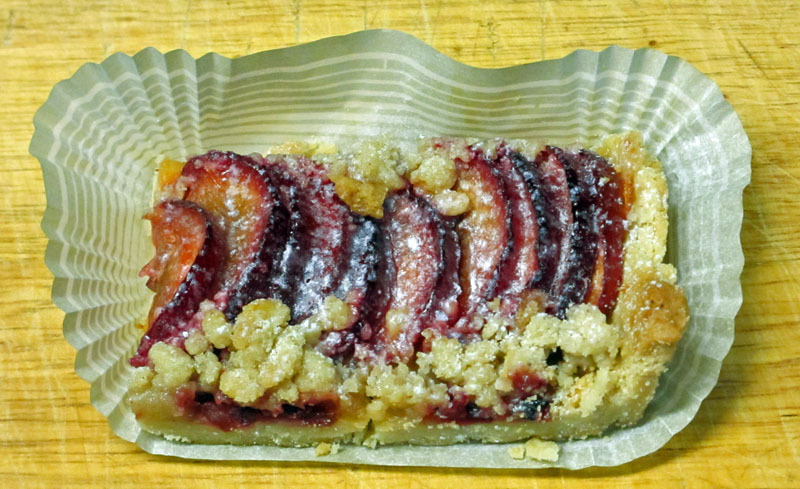 I ordered a loaf of the rye bread and just had to try a dessert as well, the Plum Kuchen. Both were excellent. I like rye bread but don't eat a lot of bread, but as soon as I got home I had two slices, one toasted and one fresh. MMMMmmm.... Wow, this is good rye bread. And, I froze half the loaf to enjoy later. The Plum Kuchen was also very good, quite flaky and sweet, and quite delightful. The bakery has a wide selection of sweets as well as many varieties of breads. Based on my first visit there, I know I'll be going back again. And again. And again. Wonderful!